Newly crowned world champion Lewis Hamilton has recorded Mercedes’s 100th pole position in Formula One at the Brazilian Grand Prix. 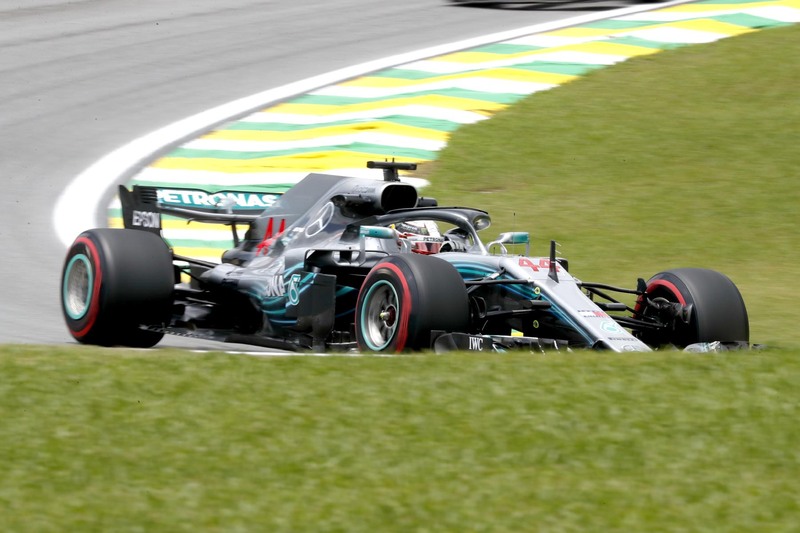 Hamilton took provisional pole after his first run and was one of only two drivers in the session to improve with his second attempt, setting a new lap record by more than a second in the process. Sebastian Vettel missed out for Ferrari by just 0.093 seconds after a mistake in the middle sector cost him his second attempt, but the German said he was satisfied with the result. “I think it was good fun,” he said. “I had a good start to the second attempt at turn 3, so I thought I’d go for it, but it was a bit too much. But Vettel’s qualifying result was marred by a stewards investigation for failing to obey regulations regarding random weighbridge checks, with the FIA accusing him of destroying its scales by failing to switch off his engine during the check and driving off under his own power. He was given a reprimand and fined €25,000. Valtteri Bottas qualified third, but the Finn was disappointed to be 0.16 seconds off his teammate’s benchmark. Red Bull Racing’s Max Verstappen and Daniel Ricciardo qualified fifth and sixth, the pair separated by just 0.002 seconds. Ricciardo will start 11th after taking a five-place grid penalty for a turbocharger change. Marcus Ericsson was the star of the session as the only driver other than Hamilton to improve his Q3 time on his second lap. He qualified seventh, one second behind Hamilton but two tenths ahead of teammate Charles Leclerc in eighth. Romain Grosjean qualified ninth for Haas ahead of Toro Rosso’s Pierre Gasly in 10th. Rain began to fall in the minutes before the session, forcing all 15 drivers out to bank a dry-weather time. All cars went out on the supersoft tyre initially, but Ferrari made a high-risk gamble to bring both Vettel and Raikkonen in for a change to the more durable soft tyre to set the pair’s race-start compound. It almost backfired, though, when Vettel was called into the FIA weighbridge for a random check, costing him valuable time, but he was able to return to the circuit before the rain hit and set a competitive time on the yellow-striped tyre. The German, however, was subsequently given a reprimand and fined €25,000 for failing to follow FIA directions during a random weight check and driving off the scales under his own power, which the FIA said destroyed the weighing device. Mercedes and Red Bull Racing followed Ferrari’s strategic lead, but they did so after setting initial times on the supersoft tyre, meaning none of the four drivers were able to improve their times. The rain began to fall once everyone had had a chance to set a lap time, with Romain Grosjean leading Marcus Ericsson, Pierre Gasly and Kevin Magnussen to complete the top 10, but Charles Leclerc, aggrieved to miss out on Q3, took to the circuit on supersofts despite the rain in an unlikely attempt to improve. He was called back to the pit by his team, but the Monegasque stayed out — and found enough time to jump into the top 10 ahead of his teammate, knocking Magnussen out in P11. Force India teammates Sergio Perez and Esteban Ocon followed in 12th and 13th — Ocon will start 18th after taking a five-place gearbox change — while Renault’s Nico Hulkenberg and Williams’s Sergey Sirotkin knocked out in P14 and P15. With rain in the air, drivers took to the track early to ensure they logged their lap times ahead of a potential downpour. Sprinklings of rain at turn 12 spooked some drivers, but track temperatures continued to increase regardless. Williams’s Sergey Sirotkin was the session standout, putting his Williams in Q2 for the first time since the Italian Grand Prix, but it knocked Carlos Sainz into the knockout zone in the Spaniard’s penultimate race for Renault. Brendon Hartley was 17th fastest, but the margins were fine for the Toro Rosso driver, with less than 0.021 separating him from Q2. Fernando Alonso and Stoffel Vandoorne were eliminated in 18th and 20th for McLaren’s fourth double Q1 knockout in five races, the teammates separated by Williams’s Lance Stroll.